Quiz: Can anyone identify the organism pictured above. 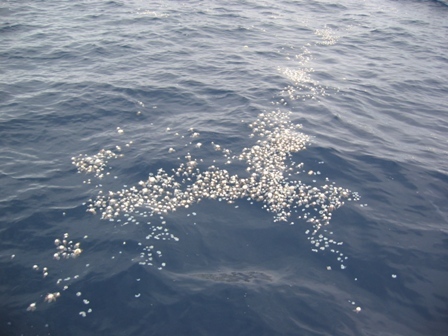 We have seen thousands of these floating on our passage between the Azores and the UK. The white central portion is about the size of a walnut. 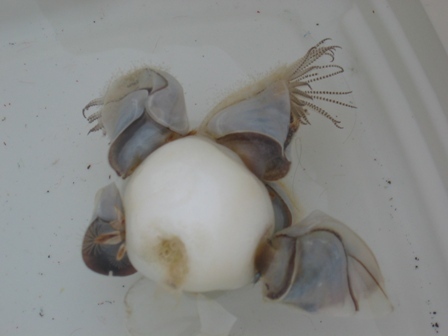 Irene Dirks was the only one to come up with the correct answer of Buoy Barnacle (Dosima fascicularis). The barnacles secrete the white rubbery center to allow them to float with the ocean currents, without the need for a ship or other object to cling to. We hope that Irene will bask in her newfound fame on the web.